Thank you alot for arranging such a wonderful 6 day Vietnam Hanoi tour package. It was great. 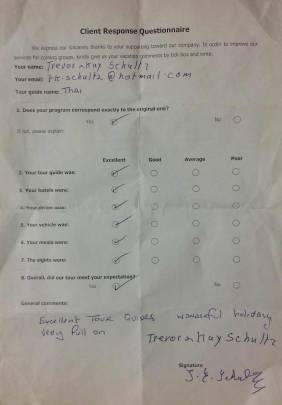 Mr. Thai and the driver were very kind and know their job so well. They were very very patient and always made sure we will not be taking advantaged by vendors etc. Our Indochina Sails cruise is wonderful. 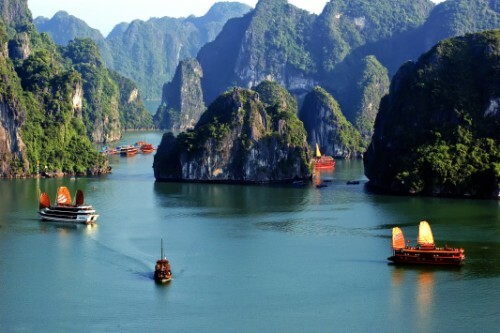 3day cruise tour Halong bay as you said is the highlight of our Hanoi package tours 6 days. 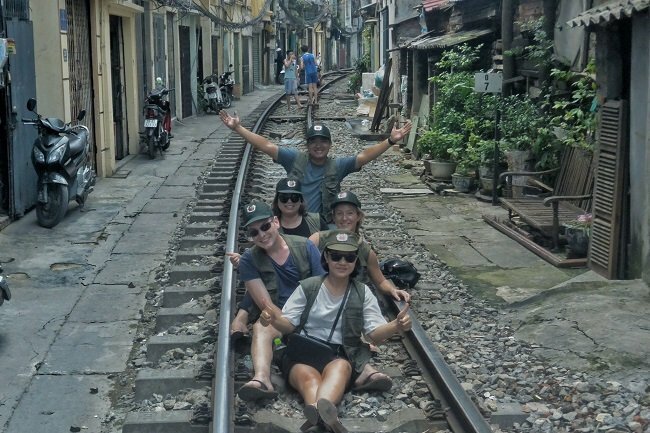 We will surely use your Deluxe Vietnam Tour company again in our next trip to Vietnam and definitely recommend your company to our friends when they plan their Hanoi package tour to Vietnam. Combination of private and small group tour Hanoi. Grade: easy & leisure. Private is always available here. 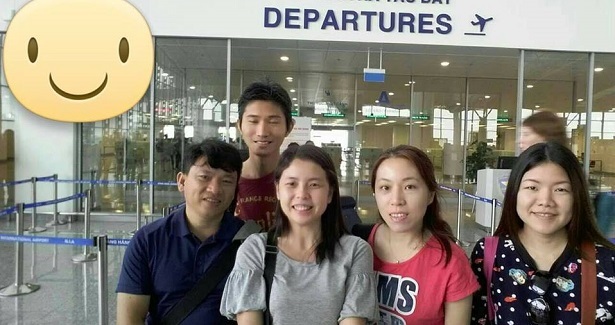 The local tour guide of Deluxe Vietnam Tour Company will welcome you at Noibai international airport and transfer to your hotel in the bustling Old Quarter for the check-in(the hotel chosen by us is 5minutes of walk to Hoan Kiem lake). Hanoi is a serene city of lakes, shaded boulevards, verdant parks and grand French architecture. Free and easy walk around your hotel for the 1st sense of Hanoi city as we choose your hotel located in Hanoi Old Quarter - best location in Hanoi city. Overnight in Hanoi 1000 year old capital of Vietnam. Your full-day adventure tour Hanoi starts with the most famous and interesting sites - Ho Chi Minh mausoleum with a chance to see Ho Chi Minh President inside. Getting out of the mausoleum, you walk along the road leading to a wonderful garden of ancient trees. Here, you will be amazed with the charming yellow palace in the French colonicial architecture. Wander around the garden and you will see a lovely wooden house on stilts with the Tay ethnic group's architecture. This is the house where Ho Chi Minh lived during the last years of his life. Coming here gives you the feeling of peace, romance and close to the nature. 11 years living here as the leader of Vietnam under the war-time, Ho Chi Minh was so busy with all kinds of work. However, the romantic space of living helped him create some wonderful poems as well. Bring your camera for wonderful photos. This area is the best of Hanoi ground tour. Continue to tour Hanoi with One Pillar Pagoda. Some tourists planning their Hanoi holiday package want to take this pagoda out of their Hanoi itinerary 5 days at first. Luckily, it is located on the way out from Ho Chi Minh complex and they can see this old and charming pagoda from their way. They have been so attracted to come closer and photos are a must. So beautiful and different that do most tourists think. Next to One Pillar pagoda is Dien Huu pagoda which is 95% visitors on Hanoi vacation miss. However, visiting this pagoda, you will see the difference from Buddhism in the North with Buddhism in the Central & the South of Vietnam - Really beautiful Buhhdas in golden lacquer. Your tour guide will show you the difference in Buhhdas worshipped between the pagoda in the North and the central and the South. Here, your local guide will share the way which Hanoians practise Buddhism. The next stop for this morning Hanoi package tour is Temple of Literature - the most charming temple in Vietnam. It is the first university in Vietnam since 1076. The first entrance exam happened here in 1075. However, it was closed by the French in 1919. A visit here will give you chances to learn Vietnamese education system since 1076 and how Vietnamese people became the king's officials. Besides this, you will see the unique blend of nature and Vietnamese architecture in this charming temple. Your afternoon Hanoi package tour starts with the excellent museum of Vietnamese women. It features daily life of Vietnamese women. You will be amazed with colorful uniforms of different ethnic groups. Most of visitors are admirated with the role of Vietnamese women in the war against invaders. The most wonderful part of Hanoi tour package comes at the end with 1 hour rickshaw tour around bustling Ha Noi Old Quarter. Amazing, Amazing... Amazing is the feeling of most travelers after the rickshaw tour. The end of the cycling tour is at Hoan Kiem lake where you can join a leisure walk with local people. This is the place for the old people to meet and talk with friends, but it is also the place for the young couple sitting under the willows weaving their future dreams. Overnight in Hanoi capital of Vietnam. 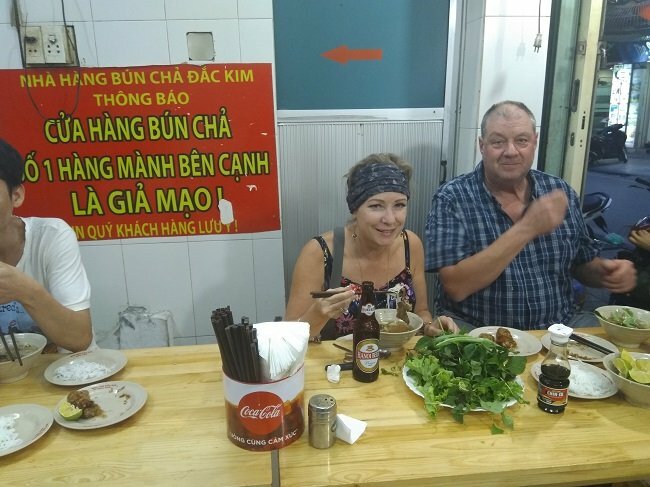 If you would like to experience the real Hanoi, join Hanoi street food tour with local expert of Deluxe Vietnam Tour Company - Hanoi tours by locals. Eat as locals in Hanoi. The local Vietnamese food sold on the streets in Hanoi. Many courses of Hanoi food are voted by travel magazines and CNN channel as top of the best to be tried by for death. No wonder - It will be one of the most beautiful dining in your life. Hanoi is chosen as one of the greatest cities for Street Food that made US President - Obama ate Bun Cha Hanoi - Grilled pork with noodles with his famous American chef - Anthony Bourdain(Meals: B). The local tour guide of Deluxe Vietnam Tour Company pick you up at 7:20am at your hotel in Hanoi to Halong bay - join in van with group. The Southeast journey goes through beautiful countrysides in the Northern Red River delta. On arrival, board your Halong bay cruise. After 30minute cruising, you will be soaked with fascinating Halong Bay. 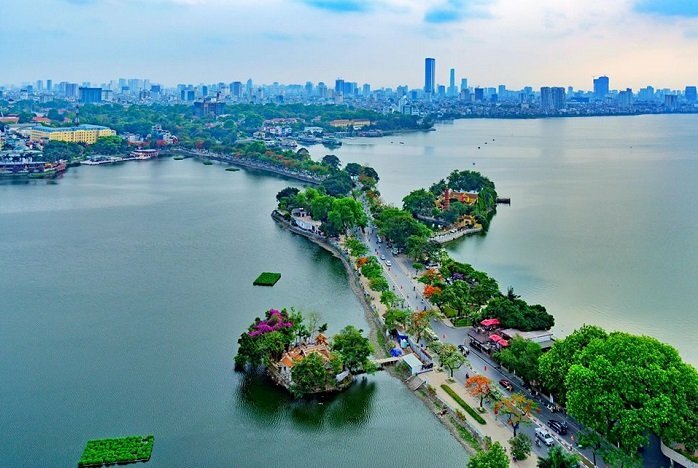 Now, you understand why it has been twice selected as World Natural Heritage Site and must-see destination on Hanoi package tours and all Vietnam tour packages. Kindly noted we do not operate Hanoi Halong bay tour package with cruise under 3star level as there are some boat sinkings happening here with low cost cruise - Halong cruise sinking. Enjoy your seafood lunch while getting soaked with stunning scenery of 1969 unfinishedly scuptured islands coming up from emerald waters. Around 15:30, you get on the tender to be transfered to Sung Sot cave which was discovered by the French and named De Surprising Cave. The travelers on Halong bay tours have reported that it is one of the best limestone caves in the world with amazing stalactites and stalagmites. It takes 45minutes to visit the cave. Kindly noted there are about 300 steps up and down. So heart attack travelers or knee pain travelers should think carefully to see it ornot as you will get in at one gate and get out at another gate - One way street and the tender will pick up you on the other side of the island. Get back to your Halong bay cruise for a short journey to Tittop island. It is time to lie down on the beach and swim. For active and enthusiastic explorer, climb 330steps to the top of the mountain for panorama view of Ha Long bay. Back to your cruise for a romantic sunset. Overnight onboard. Waken up by the birdsinging for a new wonderful day, you will sit on a small boat rowed by a local girl to explore Luon lagoon. Back to your junk for refreshment. 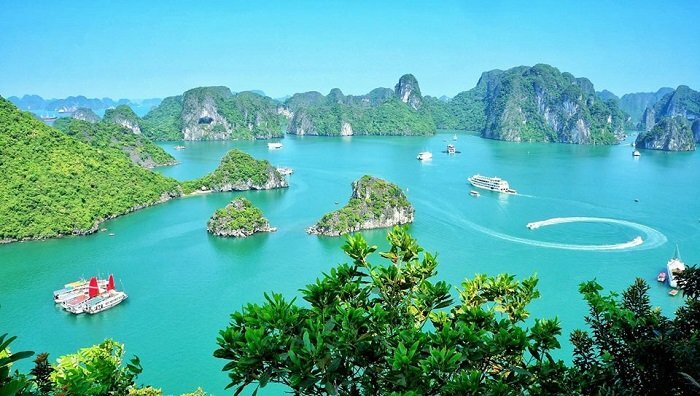 Your Halong bay tour will continue going through nice scenery of many unshaped islands. Enjoy your brunch while cruising back to the pier. Join in van for the journey back to Hanoi. Being tailor-made for not only Western tourists, but this 5d4n Halong bay Hanoi travel package is also created for the travelers in Asia countries. This is the best buy 2018, 2019 of 5day Vietnam tour packages from Singapore, Kuala Lumpur, Penang - Malaysia, Manila - The Philippines, Thailand, Indonesia, Taiwan, India... Plan Hanoi tour Vietnam, stay overnight on boat in Halong bay is a must. 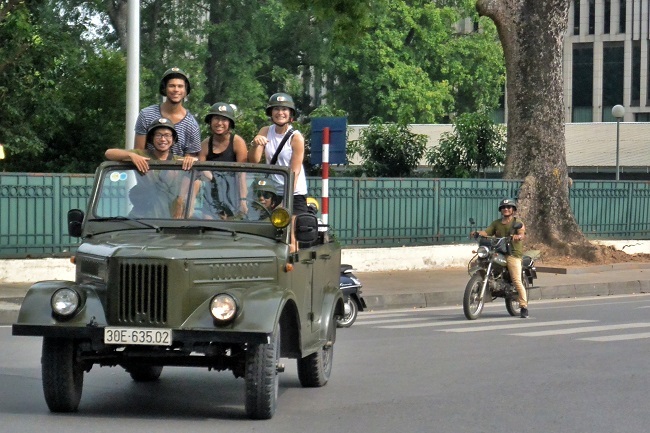 Physical Requests: A leisure Hanoi package tour for everyone at any age. This is join-in group Hanoi tour package: if you are the 1st person to get on the bus, you can sit anywhere you like. In this case, the bus goes around to pick up more tourists and you will go around, too. However, if you are the last person to get on the bus, you will have to sit the last available. 2 or 3 of you may not sit together depending on the seats available. If you do not want to waste your time on this thing and wait for other travelers. 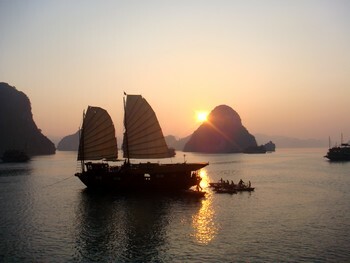 Private Hanoi tour Vietnam to Halong bay is a best choice. Hanoi Tour guide: Local tour guide with great knowledge of local culture, history and destinations. Detour Hanoi and Halong bay. What to take for Hanoi trip: sun cream, sun glass, rain coat, umbrella, warm coat in winter. You should bring small bag for Halong bay tour as the rest you can leave at Hanoi hotel. Thank you so much, so much for being an excellent tour guide and tour leader on our Vietnam tours Hanoi to Ho Chi Minh and Cambodia. Thank you for your hard work, your cheekiness, your assistance and sharing so much information. 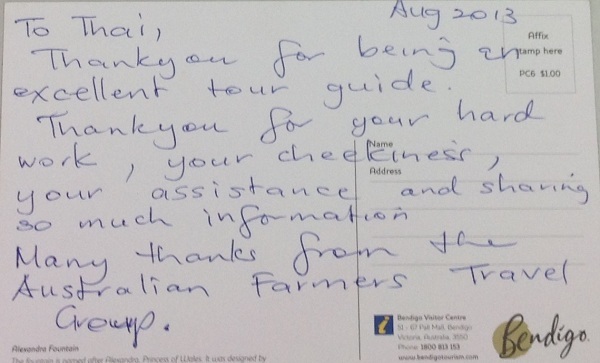 Many thanks from the Australian farmers Travel group. 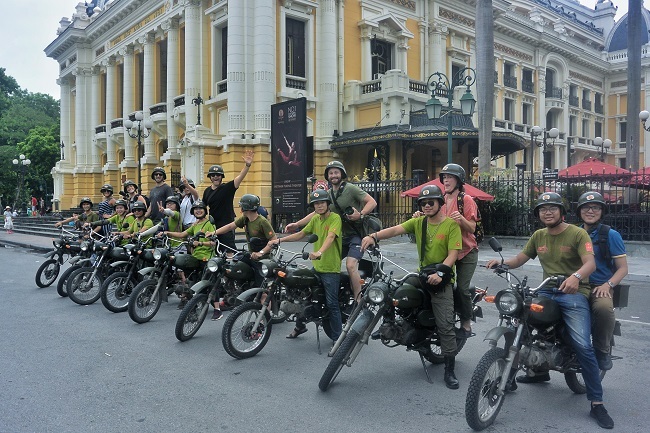 How to Customise & Book Your Hanoi Group Tours With Us? I am going to have a company meeting in Vietnam placed in Hanoi from 5th to 11 December. We will stay in Hanoi including 2 days Halong Bay cruise. I would like to arrive earlier with a small group of colleagues, 6 max to 10 people, we are going to stay from Sunday morning 30th. Nov. to Thursday 4th. Dec in the evening to have a Hanoi trip. Could you advice the best 5 day Hanoi package tour itinerary,please? We have to be around the noon 5th. Dec in Hanoi. This is a brief 5day North Vietnam tour itinerary. Please see the full details of your Hanoi holiday package with price in the attached file. Please feel free to customize your Hanoi tour package with us. I look forward to hearing from you. Thank you to send me Hanoi itinerary 5 days. I have to speak with another member of our group and let you kmow later, in the end of July. I am back and would like to change our Hanoi itinerary 5days a little bit. We got the programme from our company, which is enclosed. Could you change our Hanoi package not to visit any place twice, please? We would like to stay one more night in Maichau. Please see the details of your Hanoi package tour 5 days in the attached file and if you need any chances. Do not hesitate to inform me. Please tell me how many people in your group and I can give you the quotation. We have a little complication, because some of people, who would like to stay in Vietnam have before our traveling another meeting in Prague and we are thinking to postpone our Hanoi tour Vietnam aftewards the lallemand´s meeting in Hanoi. It means, we would stay at the hotel overnight Thursday 11th. Dec. and our Hanoi trip could start on Friday 12. Dec in the morning and finish on Tuesday 16th. Dec. lunch to fly back to Europe - cca 17 (5p.m.) from Hanoi. Could you prepare the alternative similar Hanoi package itinerary, please? you can prepare the first draft of Hanoi tour package price also. We are very small group at this moment - only 3 persons, but I am going to ask more my colleagues to stay with us, let´s say 10 persons. Please see the price with inclusion and exclusion and the hotel room photos in the attached files. Do not hesitate to contact me if you need futher information. I would like to confirm our trip to Hanoi, which you have offered for 3 persons. Please send 30% deposit to Our bank account and the rest amount will be paid in cash when you are in Hanoi. _Food as itinerary: B - breakfask, L - lunch, D - dinner. Please see our bank account information in the invoice. Just 2 comments, my colleagues asked, do we have 2 rooms for 3 persons? In case we would like to have 3 single rooms, the price would change? Could you explain, please? Is the address of bank comleted? No postcode? Thank you for the mail. Yes, you will have 2 rooms for 3 people. If you want to have 3 rooms, Hanoi land tour price will change. It means that you will pay more for that. I have suggestion. 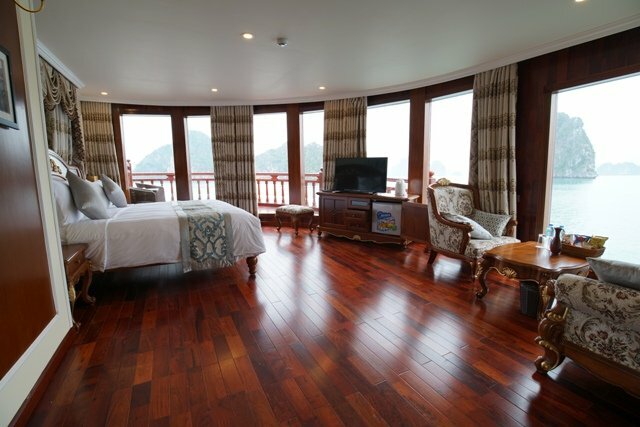 You have hotels in Hanoi, Ninhbinh, Maichau. So, one person will have a single room in one place if you do not want to pay more. If you want 3 single rooms, please let me know. The second comment: the bank address is completed. Thank you for your mail. The price for 3 single rooms: usd/person * 3 = usd( total for group of 3 person). If you need any further information, do not hesitate to contact me. Could you send me the calculation with the same Vietnam itinerary for 10 persons group with 10 single rooms, please? We ate trying to find another colleagues to be a bigger group and reach better price. Thank you. 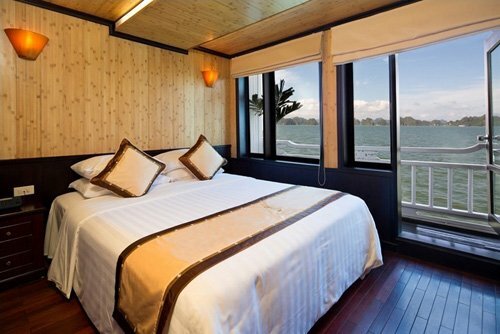 The solo bungalow hotel in Maichau has only 5 rooms available at the moment. finaly, it looks we are 3 persons group, all have booked the flight tickets already, we are going to leave Hanoi on Tuesday 16th. December later in the evening, at 23.55. Could you confirm our Hanoi itinerary, maybe we should to finish with dinner and go to the airport to be there around 21.00 /9 p.m. We decided to stay in 3 single room. Confirm the price and needed deposit, please. Please deposit 30% = USD to our bank account and the rest of XXXX USD will be paid in cash in the afternoon of 11th Dec at your hotel. I would like to have a quote and enquiry for a Tour in Hanoi to Halong bay from Singapore for 7-8pax (including 2 senior citizen > 50years old) during 24th Dec - 27/28th Dec.
Warmest welcome from Deluxe Vietnam Tours Hanoi Office! Thank you very much for contacting us. Please with some more information to customize your Hanoi tour package. Please inform us the hotel lever you would like to stay on your Hanoi trip - 2,3,4,5 star hotel. If 7 persons in your group, the triple cabin on the boat or some triple room at hotel has only 2 beds( 1 double bed for 2 persons and 1 single bed for one person - There is not triple room with 3 single beds). If 3 mem or 3 ladies do not want to share the bed with another, we have to take 4 rooms for group of 7 pax. I look forard to hearing from you. I would prefer at least a 3 stars hotel or 4 stars hotel during my Hanoi trip. As for the cabin on boat, is alright to share as all of us are family. No issues to share the double bed. Besides, please advice if the Hanoi tour is guided in Mandarin or English or is there a choice for language? Please see the details of the Hanoi trip packages and some photos of hotels and cruises in the attachment. For tour guide, I will try to have Manderin tour guide for your group if it is available as Manderin tour guide is used for big groups only. Please advise the rate for 4D3N Hanoi Tour Package during 25th (arrive Hanoi 8.15am)- 28th FEB (depart Hanoi 9.00am) for total 8pax adults. If I am looking for 3-stars hotel + 5-stars cruise stay, what is the different compare to 4-stars hotel + 5-stars cruise stay? 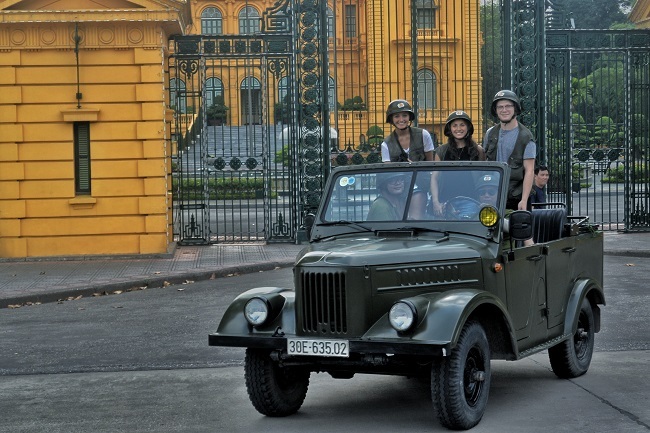 No Hidden Fees: Private tour Hanoi for your family: Price based on twin-sharing/ Triple-sharing – No Hidden Cost. Please see the details of the Hanoi trips and some photos of hotels and cruises in the attachment. For tour guide, I will try to have Manderin tour guide for your group if it is available as Manderin tour guide is used for big groups only. 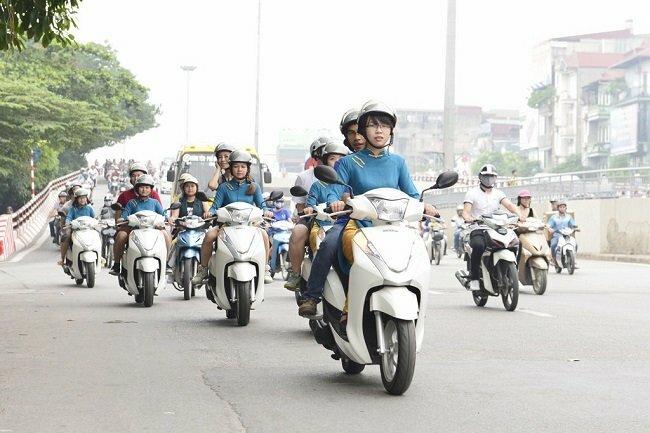 Private tour in Hanoi for your family: Price based on twin-sharing/ Triple-sharing – No Hidden Cost 1/ Private tour: You will have a private 25 seat van with driver for the whole trip and no one can join in. It will be more convenient because you do not have to wait for anyone. Time for departure and return are more convenient. Journey – Hanoi to Halong bay is 3.5hour one way. You can stop for sudden interesting things you see on the way. Please see the attached Hanoi itinerary and some photos of cruise and hotels for your stay in Vietnam. Should you have any further questions on your Hanoi trip package, please do not hesitate to contact us. Thanks for the quotation on our Hanoi package tour. May i ask if there is Chinese Speaking Tour Guide available at your end? Besides, what is the payment method and do I need to fully paid or i can pay deposit only to book for the Hanoi tour package. 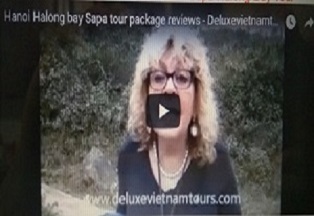 Thank you for the mail on Hanoi tour package. We use Chinese tour guide for the big groups over 20persons. However, if it is available at your time of travel, I will arrange Chinese speaking tour guide for your group. For payment, you can deposit 40% and the balance will be paid in Hanoi. Sorry for the late reply. After discussing with my family, we decided to take the Option 1 for our Hanoi package tour (Price for 8pax: USDxxx/person wit 3stars hotel + 5stars cruise stay) for our trip to Hanoi during end Feb. It will be best if you able to arrange Mandarin/Chinese speaking tour guide for us if it is available during that period of time. Meanwhile, just to let you know that our group do not consume beef due to religion issues. Kindly take note. Please advise how to confirm the booking and payment for our Hanoi package tour. Thank you for the mail. I would like to reconfirm the date of your Hanoi package tour starts on 25th Feb and ends on 28th Feb.
Do let me know if you need further information for our Halong bay Hanoi tour package. Thank you! Thanks and well received for the booking confirmation for all hotels and cruise for our Hanoi package tour. Do you need any further information from us for our Hanoi tour package? 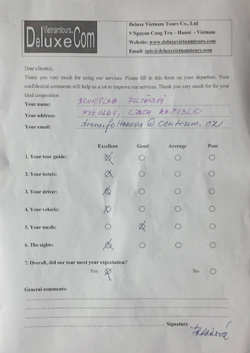 Could you please advise how do I make payment for the deposit for our Hanoi package tour? Bank transfer or Paypal? When is the deadline for me to pay the deposit? I am aware that the USD currency is increasing specially during the holiday season. Please advise so that i can make arrangement accordingly. I would like to inform you that we got the deposit from you. As I mentioned clearly in the invoice, The price does not include all the bank fees. Therefore, pay us 33.7 USD more and the balance when you arrive in Hanoi. You can see how much we got from you in the photos of our bank account in the attachment. Noted for the outstanding fee to be paid when arrive at Hanoi. What should we bring for our Hanoi trip during this time of the year. Please find the pick up board in the attachment. Please send me the flight number from Singapore to Hanoi. 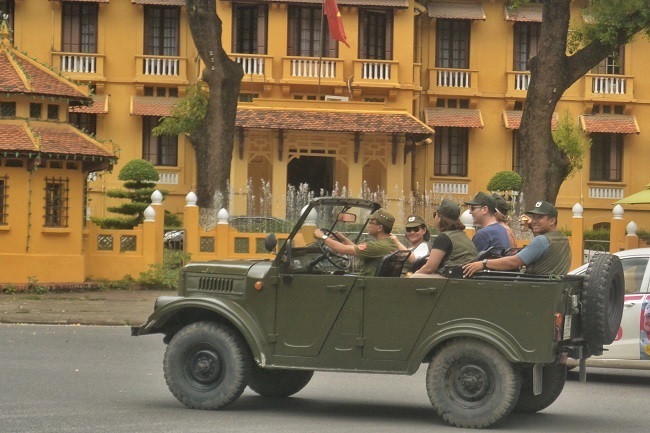 Please see the Hanoi travel tips for smooth pick up at the airport in the following link: http://www.deluxevietnamtours.com/hanoi-tours/tour-guide.html. Please send us your passport information for pre-check in with Halong bay cruise. I am very sorry for late reply as your email goes into my junk mail. 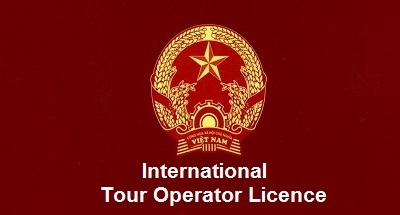 Attached above for the all the passport details (8pax) for your reference needed for Hanoi tour package. My flight number from Singapore to Hanoi is AK 516 (AirAsia). Just a simple question for you, will I be able to get mobile simcard from Hanoi aiport or can we buy somewhere? You can get at the airport or your tour guide help you to get it in the city during your trip. Ok noted. By the way, how much is the tips for tour guide and driver? Is there a min rate or standard rate for it? What is the weather like at the time of our trip? What should we bring for our Hanoi trip? Minimum tip for tour guide 15USD/day. 10USD for driver/day. 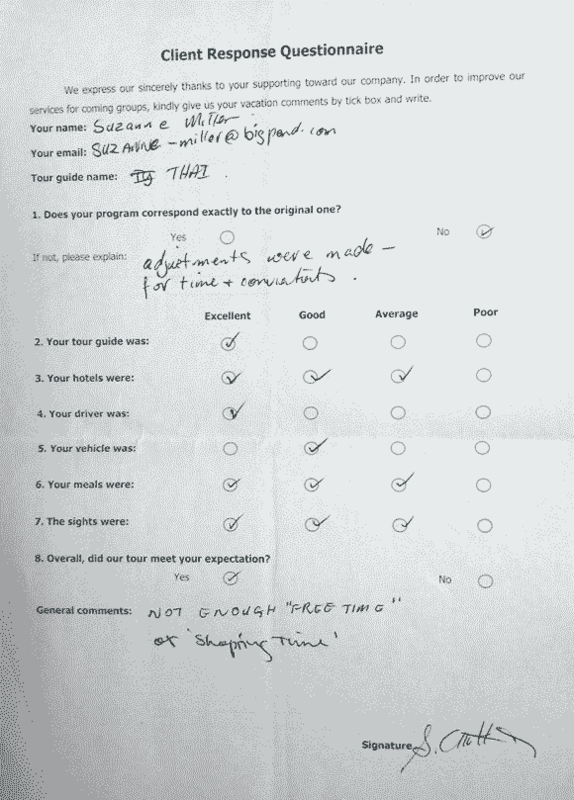 Our clients always feel satisfied with the tour guide and driver and tip them more than those. The weather at that time is fine with temperture from 25oC to 30oC so please bring sun cream, hat, walking shoe with you to Hanoi. Will it be meant that total USD 25 per pax per day for tour guide and driver? So it will be usd100 tips per pax for a 4day tour? Please advise if it is correctly understood. No. The minimum tip for tour guide is 15 USD/Day/Group. 10USD/Day/group is for driver. But normal tip for tour guide 4 USD/day/pax. Half of that for driver. Ex. 8pax * 4 USD = 32 USD/day/group for the tour guide and half is for the driver. You can tip more. Well Noted on your explanation for tipping. Thanks alot. Will prepared accordingly. I will need tip them at the end of everyday or can be in a total on final day? Please advise. You should tip them at the end of everyday as my opinion. It would be more happy for the tour guide and driver. 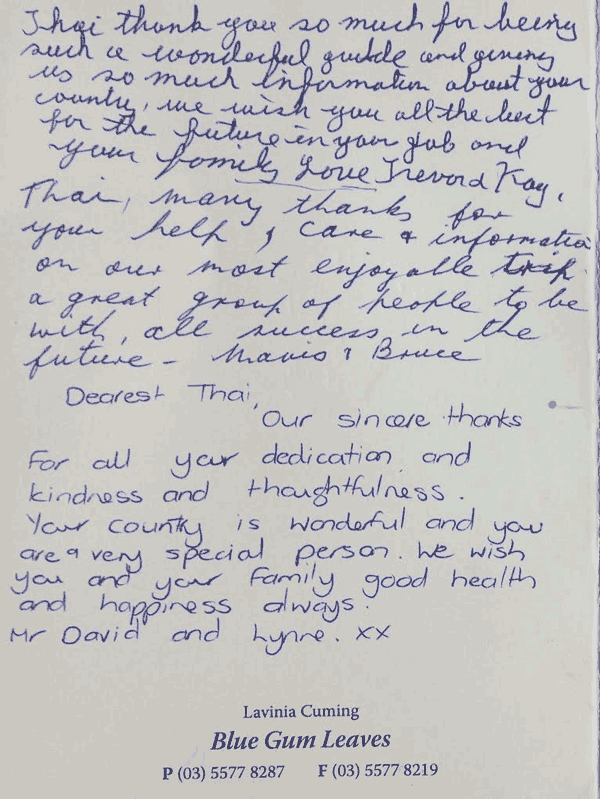 On behalf of the Deluxe Vietnam Tours team, I would like to thank you so much for booking your Hanoi holiday with us. 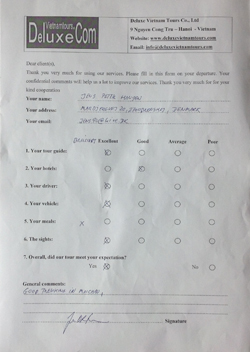 Please kindly tell me how your Hanoi trip package was with us. I would like to send all of you the best wishes. Thank you for a great and wonderful Hanoi trip experience from your team. I and my family had a really good time at Hanoi and Halong Bay. 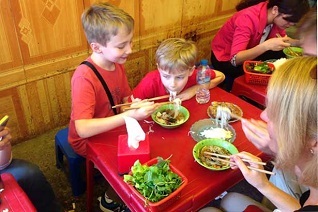 We have learned much on the local culture and taste the local Vietnamese food. We enjoyed the cruise at Halong Bay much. Overall, it was a relaxing and fun trip for all of us. Me and family wish Thai and your team all the best and hope to see you all in future. Thank you & Take care! Thank you for the mail and the information. 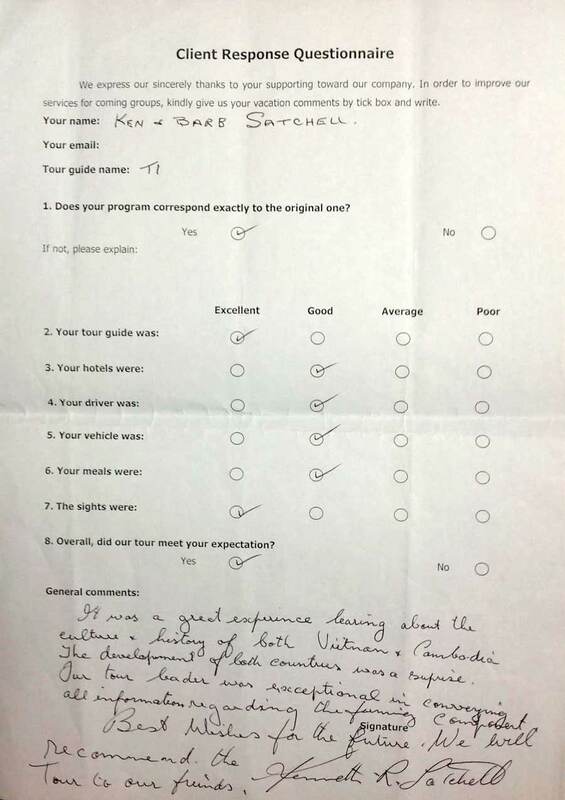 As a saleman, there are nothing better than hearing this from you. Could you do me a favor? 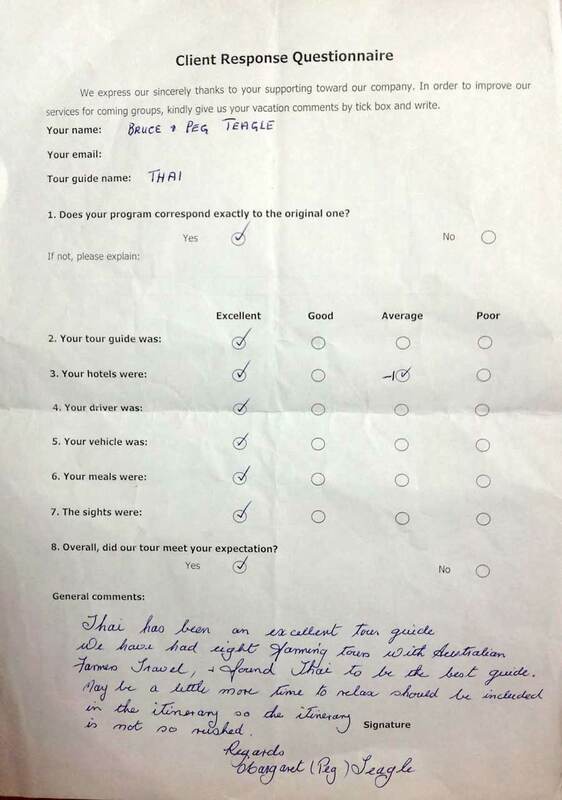 Write an execllent review. This could bring me some benefit now and will bring more clients for me in the future. 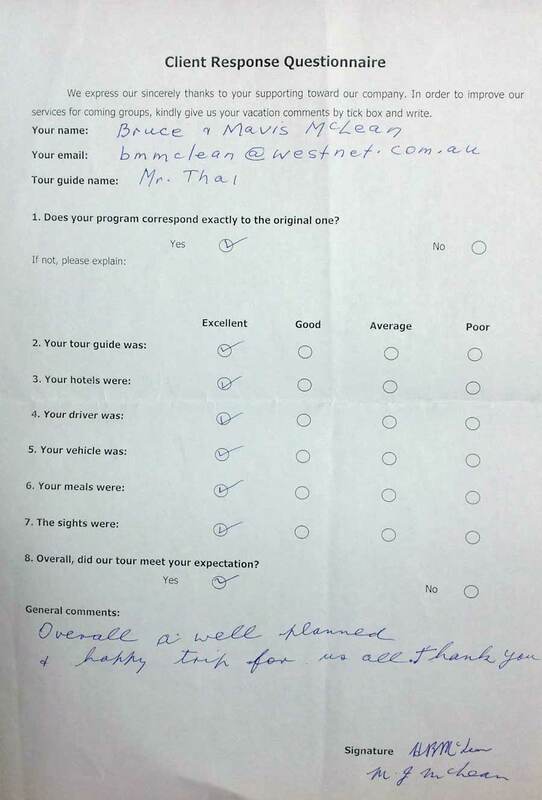 If you are very happy with me as your tour organizer in Vietnam, please write excellent reviews for our company on tripadvisor. As my boss starts paying attention to tripadvisor as an advertising way to have more clients. I do hope to have more chances to arrange more Vietnam trips to all over Vietnam for you and your friends. I wish all the best to you and your family. Sorry for the late reply as I am kinda busy recently for personal stuffs. I have already submitted a review on the link you provided below. Hope it helps. Thank you and have a great day! Take care and cheers! I plan to bring my family on Hanoi vacation this Dec. We would like to request 1. Amazing Hanoi 7 days 2. 6 days Vietnam Eco Tour We have 8-10 members ( 3 kids – 7 year, 10 year and 13 year, 4 adults, 1-3 elderly 60-73 years old ) For accommodation, we just required a clean and reasonable hotel. Please provide your best quote and the Hanoi trip schedule and Hanoi itinerary. Thank you and I look forward to hear from you soon. Please see the details of 7day Hanoi tour package in the attached file. Please see some photos of hotels and cruises in the attached files. I will come up with 6 day Hanoi package tour in the other email. Please see the details of Hanoi package tour in the attached file. Kindly noted: This Hanoi package is more expensive than the 7 day amazing Hanoi as 3 Day Halong bay is very expensive to compare with staying in the hotel. Should you have any further question on this Hanoi package, please do not hesitate to contact us. 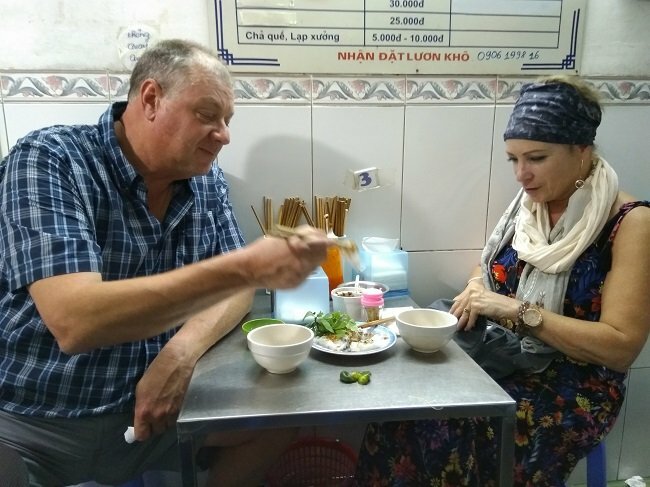 I am sorry not to mention that on the first day arriving in Hanoi, you will join with our tour guide for one of the best Pho - noodle soup in Hanoi. It is inlcuded in the price. If you are from Malaysia, you can contact one of our clients: Ms. Serene +6016361xxxx to know how we have been doing our jobs to create wonderful Hanoi trips for our valued clients. 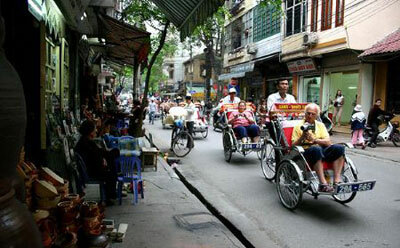 Should you have any further question on this Hanoi package tour, please do not hesitate to contact us. Thank you for your prompt reply. I will go through your proposal on our Hanoi tour package and discuss with you soon. May I know what is the different between Trang An and Bai Dinh? From the photos obtained from website www.deluxevietnamtours.com , the scenery are the same. Do you have any photos for the attractive places that we are visiting in these 2 places. Can we stay at homestay instead of hotel? For Ha Long Bay, I notice the places visit are totally different for 7 days Hanoi tour package and 6 days Hanoi local tour package. I need to explore more the places MUST GO. From the photos obtained from website, the caves and islands scenery can be seen in our 7day Hanoi package tour? Lastly, for Hanoi accommodation, do you think we can stay at home stay? Thank you for the mail. Trang An is different from Bai Dinh. Trang an has - stunning scenery for cruising, Bai Dinh is about Buddhism complex for walking in beautiful area. Home stay is possible here. 3day Hanoi Halong bay tour package is really wonderful, much better than 2 day tour Halong and the itinerary is difference. - it is a big miss if home stay in Hanoi. 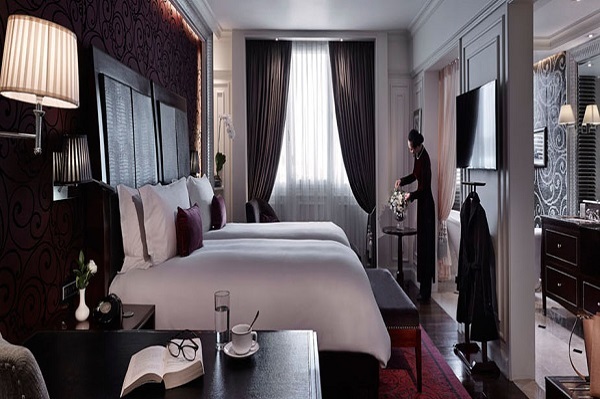 The hotel I choose for your Hanoi package is located in the Old Quarter. The best place for stay and explore on Hanoi trip. Should you have any further requests, please contact Deluxe Vietnam Tours Team. I wish to visit Vietnam this coming December ( details of my Hanoi package tour as below). 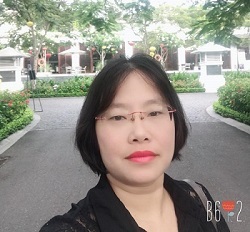 Heard about your company from one of my family member who visited Hanoi with you this Jan and wish to seek your help to organise Hanoi itinerary for us. Do let us know if you need further info and love to hear your best Hanoi itinerary. Please find the detail Hanoi itinerary 7days with some photos of cruises and hotels in the attachment. Thank you Tony for the Hanoi itinerary☺️ there might be slight change in my flight date. Once I'm done with my flight confirmation I'll reply you soonest I can. Thank you and have a good day. Appreciate your help to update the Hanoi itinerary 7 days and once we fixed that part I'll select the hotels. Sounds good? Hope to hear from you soon. Thank you and have a good day to you, Tony. 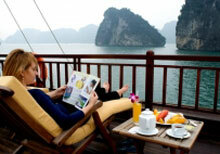 Please find the detail Hanoi package tour with some photos of cruises and hotels in the attachment. Should you have any further questions on your Hanoi trip package, please do not hesitate to contact us. I look forward to hearing from you soon as the time of your travel is very very high season. Good morning from Hanoi - Vietnam! I wonder if you got my email about the updated Hanoi package tour. Should you have any further questions on your trip to Vietnam, please do not hesitate to contact us. The last breakfast on the last day comes together with the hotel booking. Please find the detail Hanoi group tour package in the attachment. The time you travel is very very high season, so I look forward to hearing from you soon. Good afternoon! I wonder if you find out your decision. Should you have any further questions on your Hanoi tour package, please do not hesitate to contact us.